LifeBridge Health's hospitalists are the physicians who use their expertise to deliver comprehensive medical care to patients admitted to Sinai Hospital of Baltimore or Northwest Hospital in Baltimore County. Hospitalists manage the health care of hospitalized patients and engage in clinical care, teaching, research and leadership in the field of general hospital medicine. 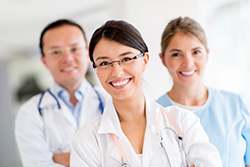 Their work can include both clinical and administrative tasks surrounding patient care. In addition to their responsibilities to hospitalized patients, hospitalists also work to improve the performance and efficiency of hospitals. This can include quality and process improvement recommendations in patient care and the safe transition of that care; efficient use of hospital resources; and enhanced collaboration and communication with all patient care providers. Hospitalists spend most of their time caring for patients in the hospital setting, offering a 24-hour presence for the patient and managing their hospital care. For the referring physician, LifeBridge Health hospitalists offer a high standard of care for the patient and a high level of communication on that patient’s status. LifeBridge Health provides dedicated phone lines to provide direct and immediate communication between hospitalists and physician offices. A 15-minute response time is guaranteed. LifeBridge Health also hosts Physician Education Forums, where physicians and hospitalists can address physician concerns and discover how hospitalists can enhance physician practices. Select time intervals: The above services are provided during designated time periods only, like weekends, vacations and single nights. Select inpatients: Hospitalists provide care for individual inpatients who require specialized attention, such as those in critical care and intensive care. Many of these patients require multiple rounds each day. The same services as mentioned above are provided to only those patients selected by the physician. Care of the patient reverts to the physician upon discharge, or at any time at the physician's request. Emergency Room Coverage: Hospitalists can provide coverage of Emergency Department obligations for call. Patients will be evaluated, orders written and admission notes dictated. The hospitalists will bill for the patient's admission. Consultative Services: Medical consultations are available on demand seven days a week, 24 hours a day. This includes elective pre-admission testing services and emergency pre-operative consultations. Should the patient have an identified primary care physician with either Sinai or Northwest privileges, they will be afforded the opportunity to perform this service. Admission Services: Hospitalists will provide admission and medical coverage for patients referred to surgeons, podiatrists, dentists and medical sub-specialists when the patient does NOT have an identified primary physician from either Sinai or Northwest. Specialized Procedures: Hospitalists are available to perform a wide range of clinical procedures on an emergent or elective basis. Examples are central line insertion, paracentesis and lumbar punctures. If you would like to utilize the services of the Hospitalist Program for your patients at Sinai Hospital or Northwest Hospital, or would like more information on the program, contact C. Ravi, M.D., Clinical Director of Hospitalist Services, at 410-601-WELL (9355). Please call Steven Capo at 410-871-7610 or e-mail scapo@carrollhospitalcenter.org for additional information about the opportunities at Carroll Hospital. Patients will return to the care of the referring physician upon discharge. Physicians will receive reports and notification upon a patient's admission, discharge and change of status. Referring physicians have access to patient information relevant to their stay. 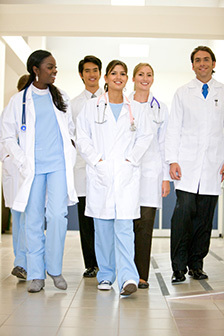 Hospitalists are available to patients and physicians 24 hours a day.